I bought 5 to test them out. I realised during the week as I painted a zombie horde, that I had run out of room in my KR multicase to store all my figures. The main reason was that while there are better boxes and better foam, I didn't want to faff around ordering them separately and cutting them to fit.. And I certainly couldn't do it for less than £1.50 per complete unit. The cases are thin plastic, almost exactly the same as old VHS cases, with 2 thin bits of loose foam. I considered glueing them in, but having at least one of them loose allows you to store cards etc. in the top. I am storing the unit's QRF cards along with them in the same box. Nice. I like that I can print out my own paper sleeves to ID the boxes. As you can see, this makes them quite neat and handsome to store on a bookshelf. I would have gone fancier, but I have become stingy with printer ink.. And I'm telling myself that the minimalist look is best anyway. I wouldn't trust the cases to 100% protect my figures in a backpack or anything. With some slightly sturdier eggshell foam in at least one of the sides, I think these would be OK to transport figures as long as you were careful. BUT, for storing them at home, they are an excellent solution for someone like me that plays small scale 15mm skirmish games. I can put a whole force, or even 2 opposing warbands into one box so I don't have to dig through my larger case to play a quick game. Overall, the lightweight nature of the cases is more than balanced out by the (amazing) price and convenience. They arrived via the post within 48 hrs of me making my order online. Bravo Mantic! 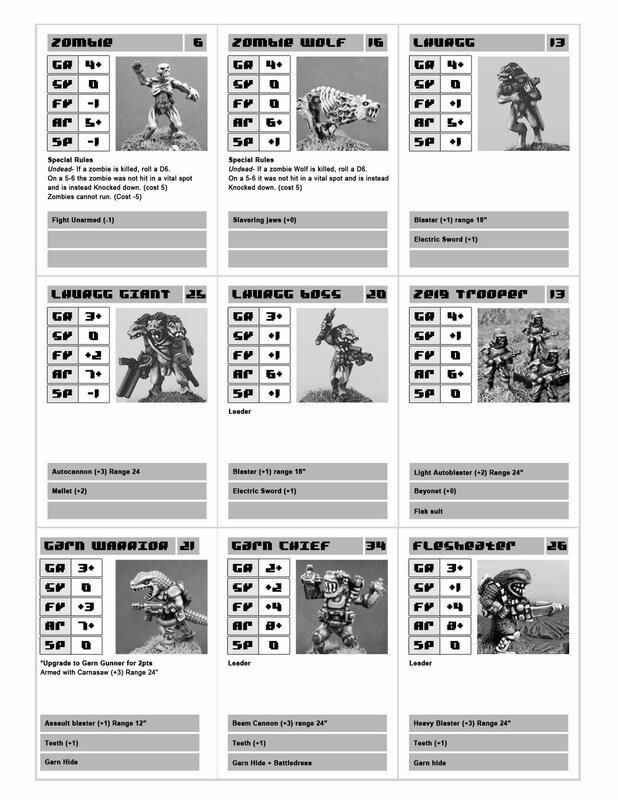 I've done a little bit of work modifying the game into a non-40k setting, but it's not quite ready for release yet. Honestly though, the game is so open and tweakable that you don't really need to change anything in the rules except the names for some things. The fact that I could stat up my own minis so easily is just the tip of the iceberg.. The (solo playable!) campaign system is brilliant. I want to have a bit of a zombie throwdown to see how it plays, so I started with those.. And immediately made up my own special rule for undead. ItEN is a pretty special effort, and I think warrants a look if your'e interested in small skirmish games with any figures you have to hand. I tried speed-painting these conversions I did of zombies from GZG sci-fi civillian miniatures to bulk out my other zombies.. The idea was to make space station crew or a science team that had been zombified. The original plan was to replace their heads with Peter Pig skull heads.. but the skulls were so small that it didn't look any good to me. I tried using a couple anyway.. They ended up looking better as base decoration. While it was a fun project, they are actually a little small next to my other Khurasan zombies. When in a mass though, they are OK I suppose. I have one pack of 7 Khurasan zombies left unpainted... Blue or fleshtone/bloody? Hmm.. I have bought a total of 3 bags of zombies from Khurasan in the last year, with the aim of gradually building up a horde. These models are brilliantly sculpted with lots of unmistakable zombieness to them. Even better, they are only dressed in rags so will work in any time period or zombie setting. My original set was painted green, and I'm not sure what I should do.. Mix the different colored zombies in with each other, or re-paint my earlier models in the new "resident evil blue" scheme I've done. The original idea was to paint them in exactly the same colours as the wolves, but I panicked at the last minute and couldn't bring myself to do more grey miniatures. I have almost completed some zombie conversions I did a while ago, made out of GZG colonists with some putty and head swaps with Peter Pig skeleton heads... Stay tuned. the complete 6 pack of wolves in 3 poses. I spray base-coated these guys black while completing some secret project models, and slapped some paint on them today. I was aiming fro a very fast paint job and they sure delivered! Glued to sand topped 20mm platic bases, sprayed black. A quick dark grey overbrush, folowed by a light grey drybrush, then painted in all the teeth/bone/blood areas in solid blocks of colour. A devlan mud wash on these areas, highlighted once with the original colours and then washed again with Ogryn flesh gave a very pleasing quick result. Picking out the eyes with yellow dots was a pain, but it looks really spooky so was well worth it. These came out really well for the small effort they took, and will hopefully get some time on the table in horror games, paired with my zombies, also from Khurasan. Crate stacks and barrels with Khursasan Post-Apoc raiders. A package arrived today from Old Crow castings. It contained some crate stacks and barrels. 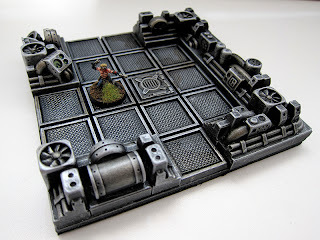 These will be great scatter cover for any of my games, and I'm really impressed with the models. I glued two of the barrel stacks together to make an upright barricade... Easy. I also got a starter pack of 15mm pipeline parts. They would work equally well on the floor or walls.. Still deciding how to make use of them. They could easily end up in either my Spaceship or Vault tile sets so I'm undecided right now. I couldn't wait to get to these, and I had a chance last night to get paint on this small elite unit. The putty conversions came out well.. Subtle but exactly the look I was after. I realize now that their uniforms are exactly the same color scheme as my recent post-apoc paintjobs.. But hey, I make no apologies.. The lime green skin makes up for it I think. The warriors are a mix of original figures and the new, which are one piece castings. I definitely recommend mixing them, as it creates a really nice diversity of pose. Finally, I finished off my spare Flesheater. I painted him with brown skin and white ceramic armor, so he sits well with the other one, while looking different to the other regular troops I have. Here's a final shot of all my Garn together.. Not much of a cohesive theme, but at least the different units are easy to tell apart! While getting a little bit of hobby time (about 2 hours) on the weekend, I ran across my unpainted Garn, and was reminded of how badly I wanted the Hegemon and Flesheater models, but then didn't paint them once in my grubby paws. So I set about doing the second Flesheater and prepping the rest. I had the idea of making a mixed skin tone unit, with more of a uniformed and less of a "naked dinosaurs in boots" look. Don't get me wrong, I think the Lhurrg are awesome models, wang out and all.. But the bare legs with human boots has always bothered me a bit with the Garn. (I think if they had open toe boots with claws poking out the front I would be happier). So I set about the small group with some ProCreate putty, which really is easier to use than greenstuff as people say. These are fairly modest conversions, but the idea is that these Garn will only have exposed heads, arms and tails. The rest of them will be painted as fatigues and armor plates. I am going to do kneepads on them all the match the Hegemon, but am wisely waiting until the trousers cure so I don't mess them up. My next painting session is set aside for secret unrelased models, so the poor old Garn will have to wait a while longer, but my enthusiasm for painting them is high. I've finished (forgot to varnish) some spaceship interior modular tiles for use with 15mm scale figures. They took a lot of planning, but were very easy to make once I had everything to hand. Following the same principle as my underground vault tiles, each one is a 5x5 gid of 25mm squares. Most of the tiles have an opening in the middle of each edge so that they may be connected in a huge variety of different layouts. 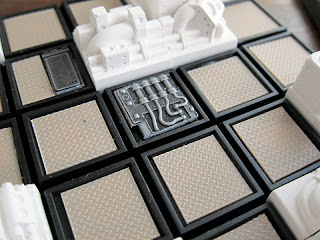 Assembly tip: I used a small individual blob of Copydex (PVA like glue) to glue each square and piece down. Spreading PVA all over the whole tile will cause it to warp. 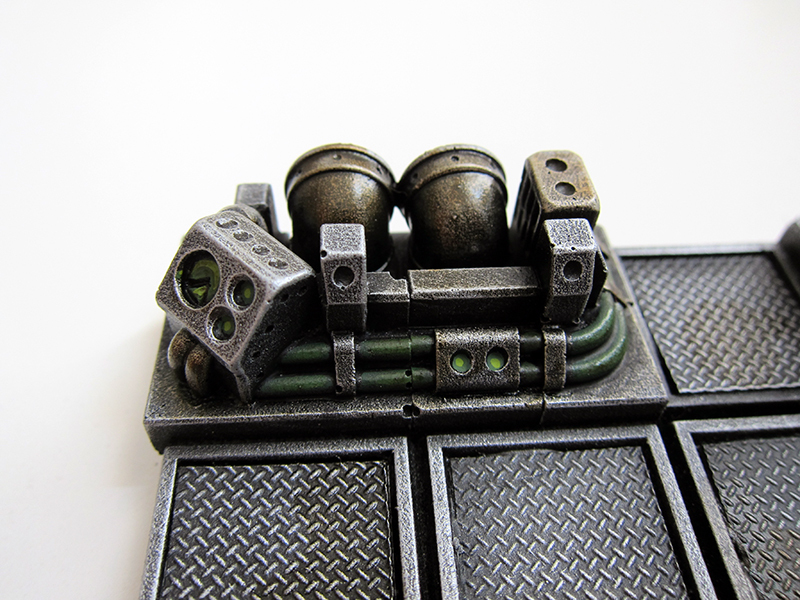 Make sure you paint PVA thoroughly over the edges of the foamcore. This will prevent the spray undercoat from eating into it. I was considering hand painting the undercoat on but believe me, spraying is a lot less hassle. 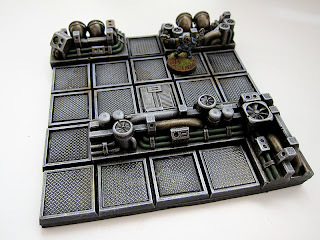 If you have a spray gun, then you can use acrylic paint and won't have to do the PVA. The painting was quite simple. I drybrushed GW Mithril silver all over the whole piece. Then I painted some of the pipes with a dark green and used a wash of brown ink/black ink/future wax on the pipes and to make some oily patches on the floor. The goal was to make the whole tile look a little less uniform. I did a little bit of an experiment and tried to paint on some green light from a computer screen spilling out. It worked OK, and I recommend adding some kind of small colored element to each tile to stop it looking dull. What really makes this project work is the Hirst Arts pieces. 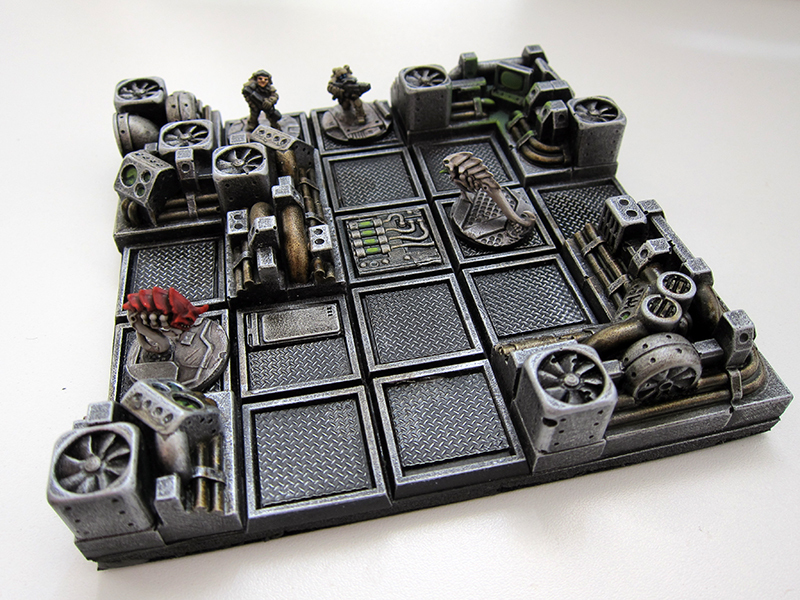 They are almost ideally suited to doing this sort of thing in 15mm... They look great and scale perfectly. I had a caster make mine because I didn't want to hassle of learning to cast my own.. 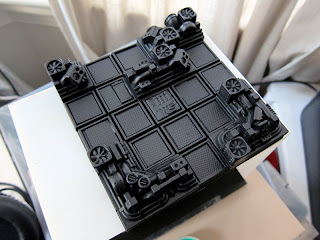 However if you have the space to do it, the savings of buying your own mold will soon become apparent. I need to order some more plastic bases now to complete this first set of 9, but I'm really pleased with how these have turned out.